“He arranged an army similar to that of chess, he placed the 2 sides in order of battle and distributed the troops, ready for battle and for the assault of the town, among 8 houses. The field was black, the battle-field square, and there were 2 powerful kings of good disposition who should both move without ever receiving injury. Each has at his side an army in its arrangements, collected at the head of the field and ready for the fray. The 2 kings advanced upon the field of battle, their troops moved on all sides around them, each trying to outdo the other, now they fought on the heights, now on the plains; when 2 on 1 side has surprised a man by himself, he was lost to his side, and the 2 armies remained face to face until it was seen who was beaten.” [cited by Roger Cooper]. Ok, so we have two games. Roger Cooper called them Civil Latrunculi (for the older one), and Military Latrunculi. Let's use these names. 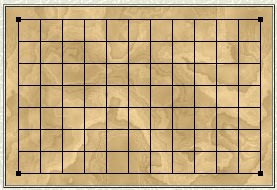 DROP PHASE - Each player, on each turn, drops a stone on an empty cell until all stones are on board. Move a stone to an (orthogonally) adjacent empty cell. Jump a stone over another stone (of either color), landing on the immediate empty cell. CAPTURE - A soldiers is captured when it is surrounded on two orthogonal sides (custodian capture). Multiple captures can be made with the same move, since the soldiers may help surround enemy soldiers on different directions. A soldier can be played inside two enemy soldiers without being captured. GOAL - Wins the player who captures all enemy soldiers, or stalemates the opponent. 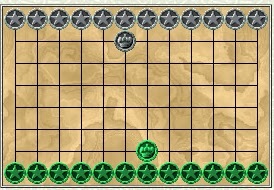 If the game reaches a position where both players cannot capture more enemy stones, the game ends and wins the player with more stones onboard. According to Ulrich Schändler, it is possible that the capture would count as a whole turn - so, the soldiers used to capture should be immobilized one turn (and of course, the capturing soldier could not also move), giving some chance for counter-measures. MOVE - Pieces move to an (orthogonally) adjacent empty cell. JUMP - Pieces may jump over pieces (either color), landing on the immediate empty cell. CAPTURE - A soldier is captured when it is surrounded on two orthogonal sides (custodian capture). Multiple captures can be made with the same move, since the soldier may help surround enemy soldiers on different directions. Captured Kings are never captured, only immobilized until one of the two enemy pieces moves out. A soldier (King) can be played inside two enemy soldiers without being captured (immobilized). GOAL - Wins the player who takes his King to the last board row. Green's turn. Green jumps his King to cell  (he is not immobilized) and wins in four moves, by threatening the jumps c5-c7 and Kc6-c8. 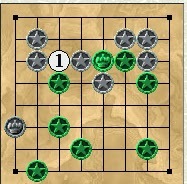 Other goal is to capture/block all opponent pieces, but this does not seem to work. Check the problem with City. L. Lynn Smith developed a Latrunculi variant for Zillions. Roger Cooper made one for Military Latrunculi (he includes an article inside the game package and several other variants). An interesting article by Myron Samsin, Pawns and Pieces: Towards the Prehistory of Chess, mentions Latrunculi. 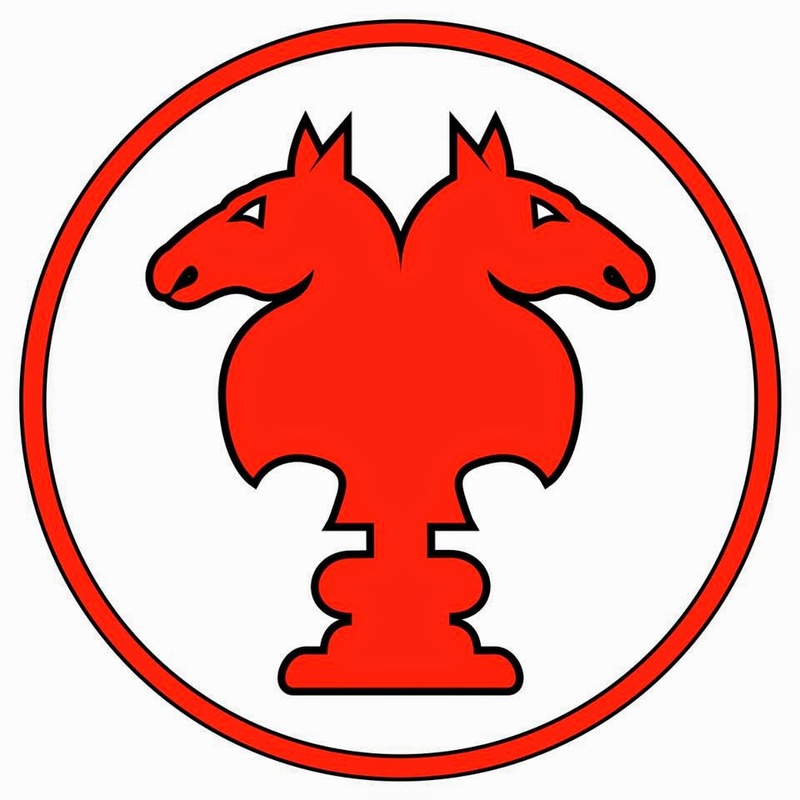 Check also Jean-Louis Cazaux's History of Chess and Roman Board Games website by Wladyslaw Kowalski (and a critic to amateur Roman games sites). Check also this one.